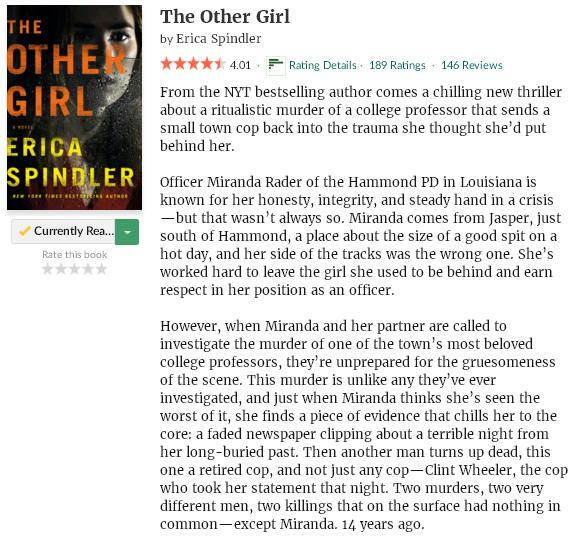 I’m currently reading The Other Girl by Erica Spindler, a Netgalley ARC I was personally invited to read and just couldn’t resist. I’ve read her work in the past and enjoyed it, so I’m looking forward to properly dive into this new thriller today! I’ve heard good things about it and so far things are looking promising. This entry was posted in Book Memes, Teaser Tuesdays and tagged book memes, erica spindler, teaser tuesdays, the other girl by Yvo. Bookmark the permalink. I loved this one! Thanks for sharing…and for visiting my blog.